Who needs to travel the world for adventure? Here in Humboldt County one can run from dinosaurs in a fern canyon, crash on an alien planet, race Lewis and Clarke across the continent, chase rebel scum on the moon Endor, fist fight under the Big Trees, search the woods for Bigfoot, and befriend a corpse on a desert island. Well, in the movies, anyway. So step right up and follow in the tracks of Hollywood stars and crews who've transformed our piece of heaven into cinematic gold. The path will lead to surprising food discoveries, modish places to watch films now and perhaps even the ghost of Harry Houdini. 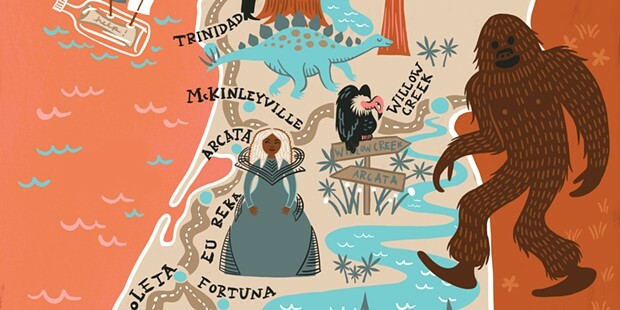 If you were Bigfoot and you needed a home, how big would you make it? 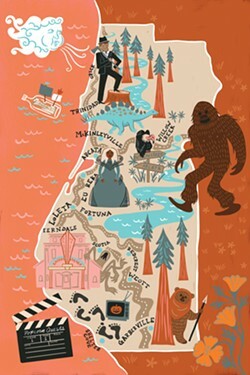 Try starting with 1 million acres, the size of Six Rivers National Forest near Willow Creek, the place where the modern legend of the hairy monster began 60 years ago this autumn, when a Humboldt newspaper coined the term "Bigfoot" following a series of mysterious encounters with the creature in the federal land's remote ravines and valleys. Many have paid homage to the Wandering Willie of Weitchpec, perhaps none better than comedian-turned-film-noir-director Bobcat Goldthwait, who, after earning kudos from GQ as best director for a dark comedy, turned his attention to Humboldt's crypto-beast. Goldthwait filmed the dark horror Willow Creek (2013) all over the eponymous town and nearby hills. To follow Bobcat's tracks, start at Bigfoot Books — owner Steven Streufert served as an advisor on the film and knows more about the creature than your average humanoid. Stop in the Willow Creek China Flat Museum, which has the world's largest collection of curios related to the big guy and a selfie-ready carved statue. Big dinosaurs might be scary but it's the little ones that will get you. 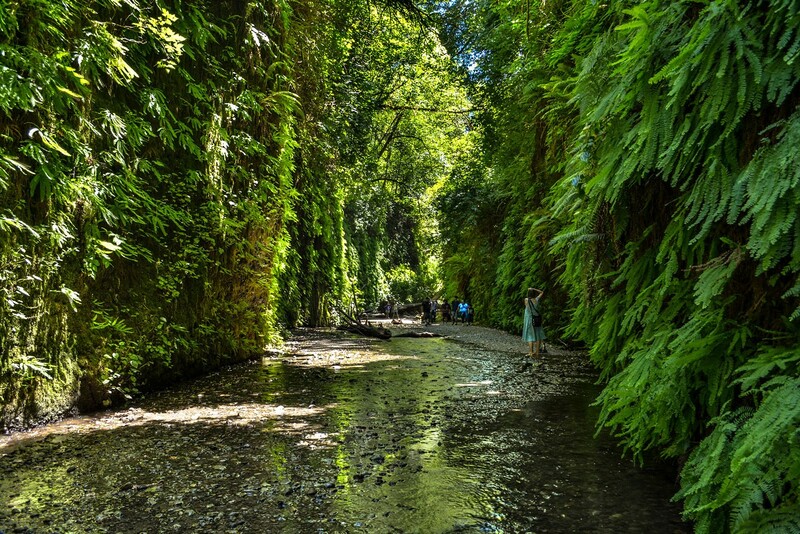 Just ask the bad guy in the Jurassic Park sequel The Lost World (1997) — he made the fatal mistake of underestimating the tenacity of a horde of hungry mini-dino-raptors, waiting to bounce and pounce in Fern Canyon, a primeval gorge with 50-foot walls draped in lush ferns. This Prairie Creek Redwoods State Park natural wonder has served as the backdrop for many other dinosaur flicks, not surprising considering that its surrounding redwood forest represents one of the oldest ecosystems on planet Earth, remaining unchanged for millions of years. Director Steven Spielberg couldn't resist using another nearby geological feature as eye candy in the film, too. Wedding Rock in Patrick's Point State Park, like Fern Canyon, stood in for the rainforests of Isla Sorna, the dinosaur land in the film and best-selling novel by Michael Crichton. Tree huggers and Earth First!ers have nothing on the environmental saint in The Big Trees (1952), an innocent Quaker girl who tries to save the old growth redwoods from various unscrupulous timbermen bent on getting their cut from the land. Filmed near Orick and in Humboldt Redwoods State Park, www.humboldtredwoods.org), the film stars Kirk Douglas as the leading man. Douglas, who agreed not to get paid to get out of his long-term contract with Warner Brothers, called the film a bad one. That might be a bit strong, considering how awesome the runaway train wreck scene is, especially since he — spoiler alert — saves aforementioned saint moments before certain doom. Ever since entering the public domain, The Big Trees has become one of the most televised of Douglas' films. And to think it's filmed in the same park as After Earth — but we'll come back to that. Sweet brined Berkshire pork chop at Gyppo Ale Mill. The fabled Lost Coast, the longest stretch of wild shore in California, is far from any urban areas, so despite its natural beauty, the region remains woefully undocumented in the cinematic sense. However, it should be noted that theological giant Thomas Merton was so enthralled he wrote his final book about the place. And a cryptozoological giant, Bigfoot, starred in the locally shot The Lost Coast Tapes (2012). Should you decide to bring your camera or camera crew to this frontier, rest assured signs of civilization abound on the L.C., in particular in the town of Shelter Cove, the lone outpost on the almost 100-mile coastal stretch. One fine example is the Gyppo Ale Mill, which is both down-home and high-class. 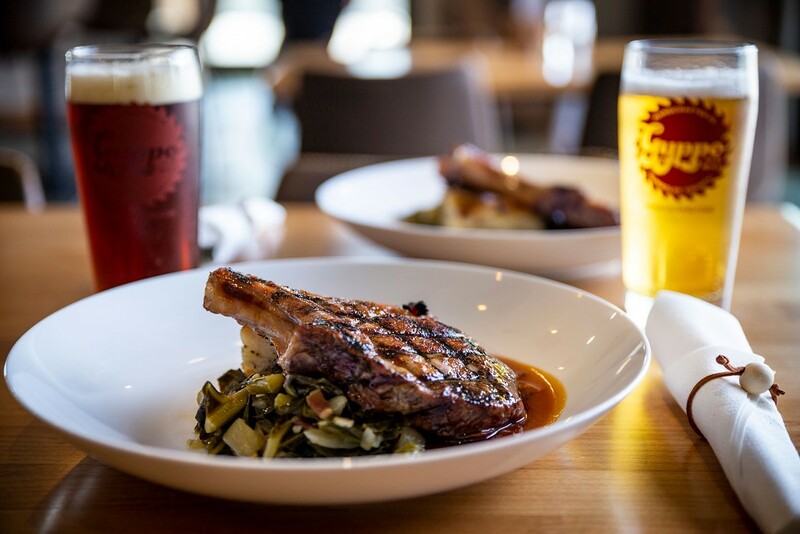 One can pair the in-house brews like Mexican Lager or Raspberry Ale with comfy pub standards like fish and chips, or more ambitious fare like sweet brined Berkshire pork chops and coconut flan. Another notable nosh stop is Mi Mochima, which features Venezuelan fare. Guests rave about the empanadas, sangria, tamale-like hallacas, green cilantro sauce on burgers, and apricot cake. And after a three-day hike (or even a leisurely stroll) along the Lost Coast, why not? History doesn't stay in the past but perhaps Almost Heroes (1998) should, according to movie critics who scored it an 8 out of 100 on Rotten Tomatoes. Still, the goofball period comedy, in which Matthew Perry and the late, great Chris Farley race Lewis and Clarke in the early 1800s through the American frontier to the Pacific, has its memorable moments, like when Perry's character attempts to teach Farley's to read. And Humboldt County shines, especially when the pair reaches its goal along Trinidad State Beach. Other scenes might better have found the cutting room floor, like the slapping contest with Native inhabitants. Nevertheless, the town of Trinidad, a fishing village perched on an ocean cliff, showcases actual Native American culture, whether in a museum, a nearby recreated Yurok village or its souvenir shops, which display and sell jewelry made in traditional style from dentalium, small delicate tusk shells, once common in the region and used as a kind of de facto currency. No assemblage of movies about Humboldt County would be complete without a movie called, well, Humboldt County (2008), a dramedy in which a Los Angeles med student accidentally disappears into an Emerald Triangle growing community. While filmed in many locations — Blue Lake, Eureka and Arcata — the grand finale features stunning Luffenholtz County Beach south of Trinidad off of U.S. Highway 101, a favorite spot for plein air artists. 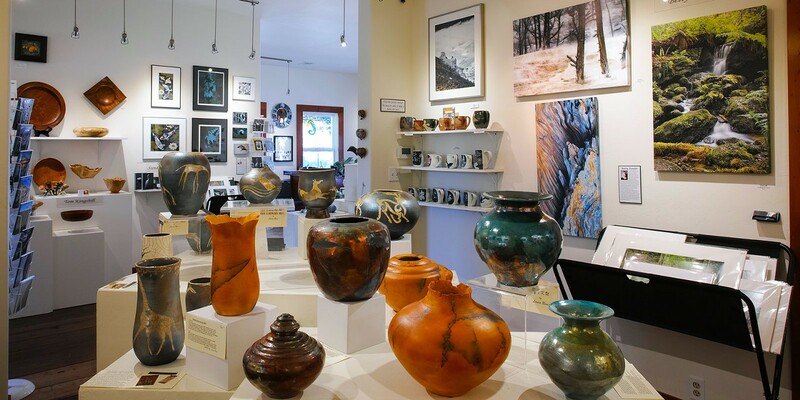 Jutting sea stacks, ocean cliffs, secluded coves and sea caves, sea lions and star fish all find their way on canvases and photographs hanging in local storefronts, including the Trinidad Art Gallery, a co-op featuring original creations of some of Humboldt's finest artists. For more artistic revelry, carouse through town during Trinidad Arts Night, the first Friday every month from May through October. What's not to love about a bro-mance in which one of the leads just happens to be dead? It's only a minor detail for Swiss Army Man (2016), which transforms the picturesque beaches and redwood forests around Trinidad into a deserted tropical island. Paul Dano shines alongside Daniel Radcliffe, sans Hogwarts wizard wand. 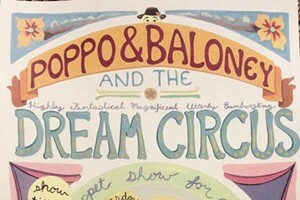 Despite the strange premise, the film delivers a creative tour de force, in large part because the corpse, improbably, serves as a platform for musical and artistic expression for Dano's character, whether as muse, de facto woodwind instrument or flaming canvas. Find yourself more traditionally inspired when the fishing village of Trinidad hosts the Trinidad Bay Art & Music Festival the weekends of August 10-12 and 17-19, featuring acclaimed classical musicians and cutting-edge visual artists, such as French artist Marceau Verdiere, whose moody abstractions hang in galleries and museums all over the United States and Europe. Don't be surprised if you see half-pint Bigfoots or adults dressed in space-age garb when hiking in Grizzly Creek Redwoods State Park, the location of the famous Endor moon speeder chase scene in Return of the Jedi (1983). Dedicated fans frequently visit the park, located 15 miles east of Fortuna on State Route 36, looking for tell-tale clues, such as the crossed X marks and the massive fallen tree that identify hidden Cheatham Grove, an exceptionally pretty stand of old growth redwoods on the outskirts of the park, as the specific location. One may find more self-identifying Ewoks and Storm Troopers in Jedediah Smith Redwoods State Park, where George Lucas filmed more Endor scenes. Oprah Winfrey plays a 60-foot witch who towers over the other characters in A Wrinkle in Time (2018), based on the classic 1962 children's book by Madeleine L'Engle. But the real giants in the 3D sci-fi/fantasy adventure are the 300-foot-tall redwoods of Sequoia Park that steal their scenes in the film. 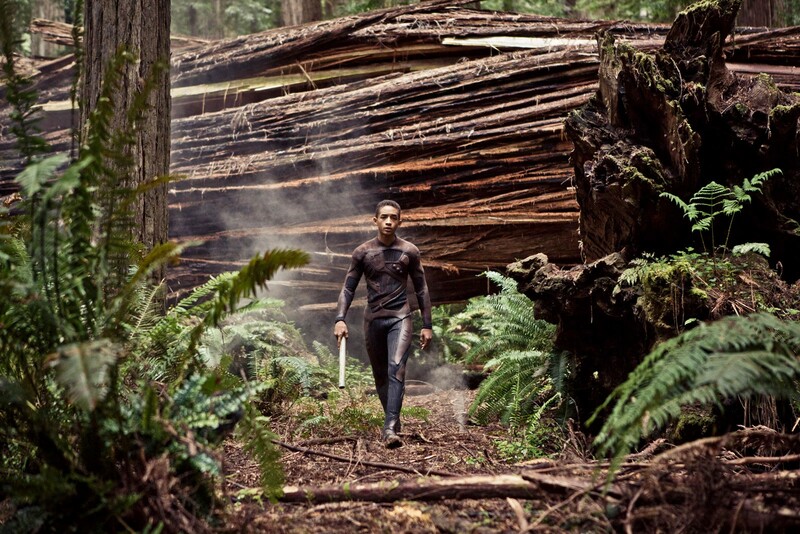 Besides the big trees, the film, directed by Ava DuVernay, displays a big heart and big ambition. See for yourself on Aug. 18 when the Humboldt-Del Norte Film Commission hosts Movies in the Park on the lawn. (If you're in Humboldt earlier, the critically acclaimed fantasy mystery Coco (2017) plays on July 21.) Musicians and Looney Tunes warm up guests at 7PM. The feature presentation starts at dusk, usually around 8:45PM. Dress warmly, eat organic popcorn and don't bring your pooch or hooch. Will and Jaden Smith got no respect for After Earth (2013), picking up three Razzies for Worst Actor, Worst Supporting Actor and Worst Screen Combo for their efforts. Honestly, the movie wasn't that bad. It was designed for a teen audience, not an adult one, said Film Commissioner Cassandra Hesseltine. This writer agrees. The much-maligned Jaden Smith did as much as one could expect in the lead role, considering the constant blathering and badgering of father Will. Nevertheless, Humboldt Redwoods State Park, the primary location for the M. Night Shyamalan sci-fi dystopia pic, earned plenty of praise. "We wanted a place that looked like it was untouched by humanity," location manager Dow Dresser told the Los Angeles Times. "This forest had a spectacular scope and really was very cinematic in every single way." We think you'll agree. 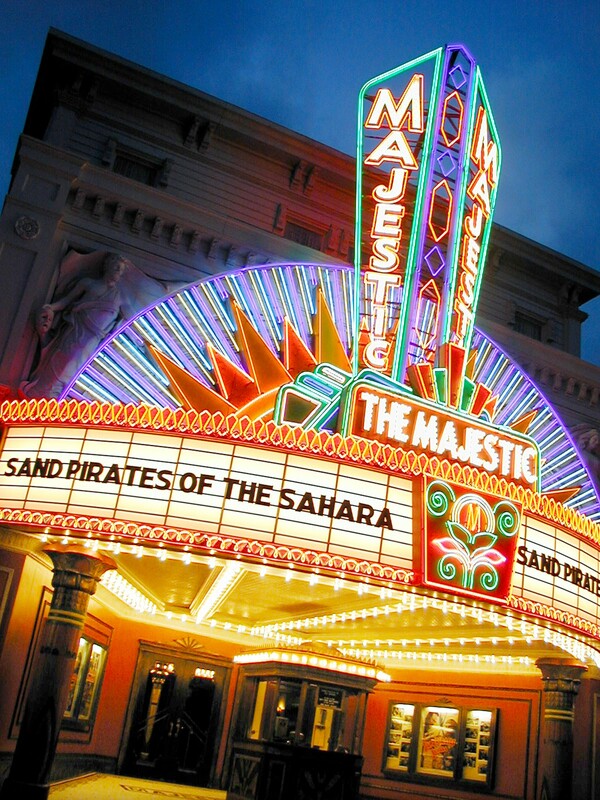 The oldest building in the nation designed for movies, the Minor Theatre has experienced its share of drama over the century. The circa 1914 landmark has survived bankruptcies, wars and, at the request of Harry Houdini, an unexpected renovation to the stage floor for his act. Now a triplex with comfy oversized recliners, beer on tap and trendy snack options like kimchi hot dogs and vegan empanadas, the Minor presents first-run Hollywood flicks and independent features. Wonder Woman created quite a buzz when the theater invited women only for a weekend show. In April, the screens light up with dozens of shorts as part of the Humboldt International Film Festival, the world's oldest student-run film fest. Celebrated as California's best preserved Victorian Village, Ferndale has served as the backdrop for many period movies, perhaps none better known than The Majestic (2001), a post-World War II drama in which Jim Carrey, in his first major departure from a comedy role, recovers from amnesia, learns a dark secret about his past and lovingly restores a small-town theater. In real life, the circa 1920 Hart Building, a Victorian vaudeville and movie theater, today houses the Ferndale Repertory Theatre, the oldest and largest of Humboldt's resident community theatres, producing impressive main stage productions since 1972. Upcoming FRT productions in late 2018 include Young Frankenstein and A Christmas Story: The Musical. For the best of first-run independent films, including documentaries and foreign offerings, unorthodox music and comedy shows, featuring everything from psych-folk to tragic pop, intermixed with cocktails, other spirits and occasional karaoke, one can do no better than the Miniplex, a small venue with big, bold dreams. Dine on mac and cheese first — the Miniplex is in the same building as Richards' Goat Tavern and Tea Room — then settle in for the show. Still hungry? Try the theater's popcorn popped in coconut oil (optional Cajun spices or nutritional yeast) or gluten-free vegan tater tots. If you miss a movie, don't fret. Some films screened at the Miniplex are available afterward to rent at La Dolce Video.